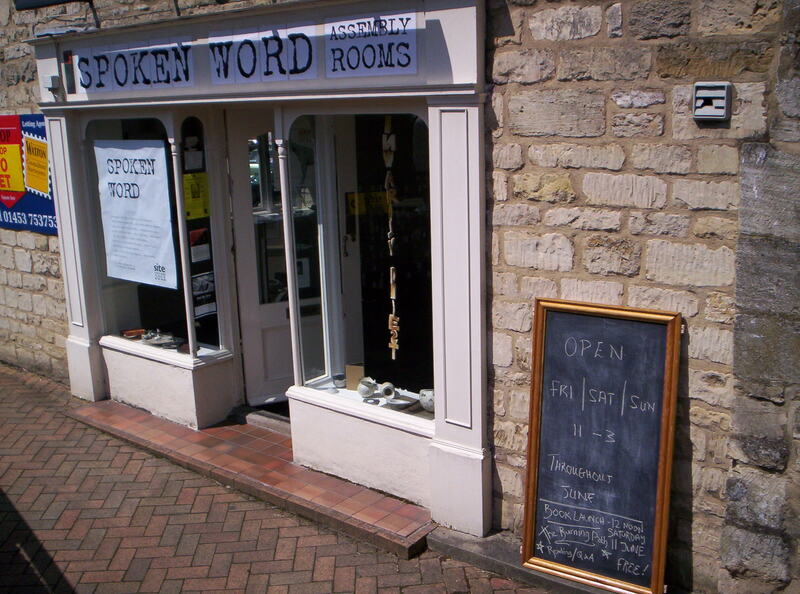 Last week I took Awen stock with the help of my friend Jay to the ‘Spoken Word Assembly Rooms’, top of Stroud High Street – as part of the SITE Festival 2011 local writers and text-based artists have taken over an empty unit (former ‘paint-a-pot’ shop; Chinese and tattoo parlour – so following on in a weirdly apt way, pushing ink). On Friday and Saturday I did a couple of stints, invigilating. Took stuff to read, even some marking, but didn’t get a chance, as folk popped in for a chat – it was nice to feel part of a community initiative, championed by local patron saint of poetry, Rick Vick. The Awen shelf (a bookcase made by my grandfather) sat in the hearth alcove and very nice it looked too. Our small press has a growing list of distinctive titles. Friday night I went down to SVA (Stroud Valley Artspace) to check out a zany collective from Falmouth ‘The Fate of Neutral Norway’. It was heartening to see such bright young things get passionate about the spoken word – and to pull in such a youthful crowd. Local poetry impresario Charles and I decided to hold fort in the ‘Old Farts corner’ and were inspired to form an impromptu trad. poetry combo, entitled ‘The Oxfarts’, reciting ‘poetry-that’s-good-for-you’ in a tweedy (or stentorian) fashion. We await bookings. I performed a couple of my poems (Phone Tree; and Wolf in the City) which seemed to go down well, especially the group howling at the end! 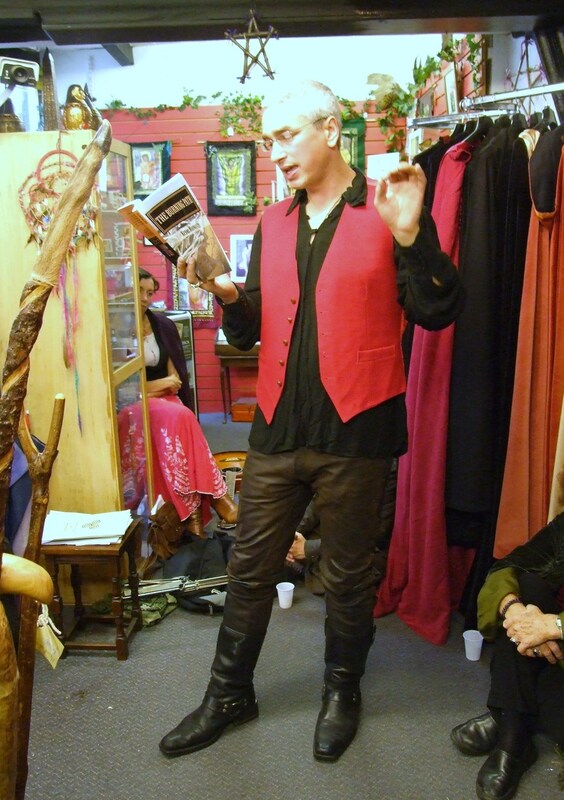 The next day, a tad tender from bardic grog, I did my second stint in the shop – this time joined by local poet superstar Adam Horovitz. Earlier in the Spring, over a pint of Budding we devised the idea of a spoken word podcast – Stroud Out Loud! or SOL for short – recording and promoting local voices (poets, storytellers, singers). We test run the ‘instant archive’- with a couple of poems from myself, Adam and Rick, who happened to be passing with his partner, Gypsy. 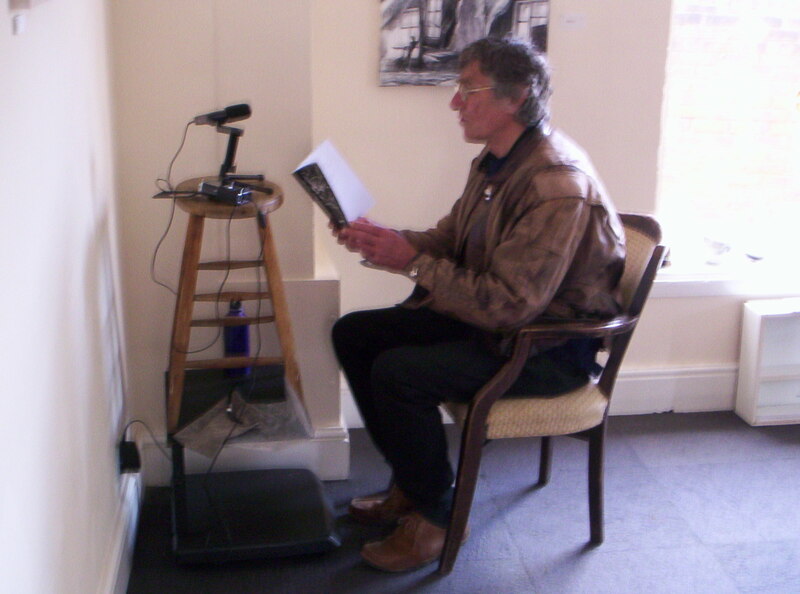 Rick records a couple of his poems for SOL - come & have a go this weekend! Next weekend folk are invited to come along and record an original poem, Fri 1-3pm & Sat 1-3pm. series since its inception in 2004 – and was ‘worried about Maud’ (the main protagonist from the first volume, The Long Woman). 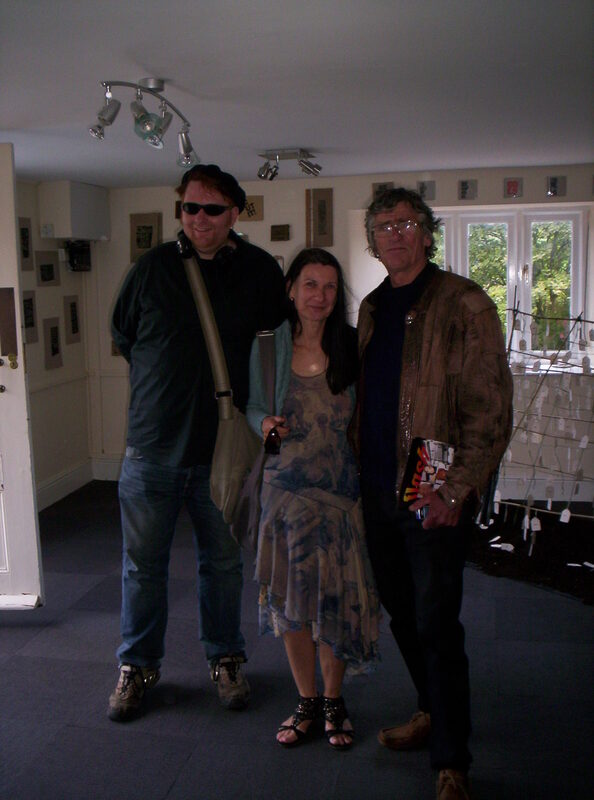 Later, after I had pitched my tent and grabbed some food I went along to the OBOD Summer Gathering, where Jay (running a poetry workshop at Chalice Well) and myself had been kindly invited by Philip Carr-Gomm. There was some splendid entertainment by the likes of Liv Torc, Paul Newman, & Damh the Bard – whose ‘supergroup’ rounded the evening off in lively style, with everyone dancing and singing along. I had a nice chat with Philip and the great historian Ronald Hutton (who I am equally honoured to know, from my days as Bard of Bath – he was one of the judges who awarded me the Chair of Caer Badon back in 1998). My friends Jay, Ola and Paul finally joined me – direct from the Carolyn Hillyer and Nigel Shaw concert at Chalice Well and we concluded our ‘baby-head-wetting’ with a wee bop together. Reeling from the tunes (and the fabulous druid mead, especially fermented for this occasion) I made my way to my tent, under the stars on the side of the Tor – hoping Gwynn ap Nudd wouldn’t seize me while I slumbered (or rather the rain wash me away). Damp, chilled & weary I made my way home the following morning (after a fortifying breakfast at Heaphy’s). Pushing ink can be hard work! Sometimes it’s hard to see the benefit – any reciprocation for one’s efforts can seem be difficult to fathom at times, but who knows what ripples one causes? Touch one heart, and it’s always worthwhile. This entry was posted in Bard on a bike, Bardic Poetry, Extraordinary People, Extraordinary Places, Travel and tagged Bard of Glastonbury, Cat & Cauldron, Damh the Bard, Glastonbury, Glastonbury Tor, Gwynn ap Nudd, Jay Ramsay, Karola Renard, Kevan Manwaring, motorbike, OBOD, Philip Carr-gomm, Ronald Hutton, Spoken Word Assembly Rooms, Stroud, The Fate of Neutral Norway on June 13, 2011 by Kevan Manwaring. I went time-travelling on two wheels yesterday – six thousand years into the past – and early this morning we were all time-travellers, briefly, as the clocks went back (as a nation, the UK travelled one hour into the past – a country-sized time-machine). Imagine the Good Ship Great Britain slipping through the Vortex, in a kind of update of The Philadelphia Experiment (in which a US Navy vessel travels through time, with disasterous consequences). awens of light breakthrough the cloud, spotlights cast upon the Levels – I watch the drama of light and darkness unfold. A kestrel hovers, poised in the hollow of the wind – he’s come up here, to this high place, for his lunch, like I. In the car park a cluster of vehicles – people having their lunch inside. [I eat my sandwiches on a bench in a bracing wind] A pair of frilly knickers by my bike – cast off in the throes of passion – a quicky in a layby – and left, a tawdry memento. Orange peel scattered by the bench I sit on – spelling whose initial? A glider arcs high overhead, beyond the wheeling birds. A black bird [a raven?] flips itself as it flies along, marking an odd cry. A swathe of rain rakes the dark line of the Quantocks on the opposing side of the Levels – gloominess passes. The sun breaches the cloud and the Levels are flooded with light. Wind dances around me, light and shadow. Peace and stillness. Blue skies after the gloom. Rising above it all. Finding the centre amidst the maelstrom. Heights from the depths. Warm sun on my face, balancing the chill in the air. Memorial trees and benches – the phantom of other lives linger, here, on these Hills of Peace. After, I descended, passed Ebbor Gorge, taking some notes from the interpretation board [Pre-10,000BC: remains of Ice Age animals – cave bear, cave lion, hyena, reindeer, wild ox, steppe pika: 3000 BC: Neolithic people sheltered in caves and under rocky ledges] down into Wookey itself, and then through the traffic lights of Wells to Glastonbury. I took the back lanes to the Tor – up through Wick Hollow – parked up and climbed, making heavy weather of it in my leathers, feeling ancient in my bones! On top I let the wind scour away any remaining cobwebs as I surveyed the vista. Here is supposedly another great circle of time, the wheel of the stars of the Glastonbury Zodaic, the local field patterns providing a Rorschach Test for Katherine Maltwood in the Twenties. We see what we wish to. Maltwood is not unique in inventing secret or ‘lost’ knowledge to make her self feel special. Glastonbury is full of such types. I’m sure some would accuse me of being of the same ilk! But what ‘mystery’ do I offer, except ‘stand and stare’, be fully present, cherish each moment and find your creative self? This entry was posted in bard, Bard on a bike, Bardic Poetry, Extraordinary People, Extraordinary Places, Way of Awen and tagged ancestors, Back to the Future, Glastonbury Tor, Glastonbury Zodiac, HG Wells, Katherine Maltwood, Samhain, Shapwick, Somerset Levels, Star Trek, The Philadelphia Experiment, The Sweet Track, The Time Machine, time-travelling, wells, Wookey on October 26, 2009 by Kevan Manwaring. Late last night returned from a talk I gave on my book Lost Islands to Sue Stone’s Positive Living group. The most enjoyable part of it was the ride down in the sunshine yesterday afternoon – I stopped off at Badbury Rings, a fairy fort near Wimborne Minister, just off an incredible avenue of beeches. Its centre, contained within an impressive triple ring of ramparts, is filled with majestic trees. Whenever I go there I always end up feeling sleepy and wanting to nod off against one – but I feel I would wake up in three hundred years time, like a West Country Rip Van Winkle. It made a pleasant pitstop, to say the least – green tranquility after the roar of the road. I used the time to get some headspace before my talk. It’s been full on lately, what with getting two books ready for publication – one for print (Places of Truth by Jay Ramsay, coming out this Friday, touchwood) and one for the publisher’s deadline (The Way of Awen – my follow up to The Bardic Handbook). What with a stack of marking as well, things could get too breaking point – but I’m staying on top of them, just! It seems I am destined to lead my life this way, by the seat of my pants, no matter how much I plan – riding the awen, trusting in it to give me the inspiration and energy to achieve whatever I need to. Feeling relaxed, if soporific (Badbury had slowed my metabolism – my brainwaves from alpha to theta – a little longer there and I would have started scribbling, but interestingly I didn’t have my notebook, or even camera on me when I went up to the hill. They had been left behind on my tank-bag. I was just meant to ‘stand and stare’ for once) I drank some coffee from my flask, checked the map and set off. I arrived in Bournemouth, at West Cliff as the sun was setting. I got myself some chips and sat and watched it and the beautiful soothing vista of cool blue water against the dying gold. I read through my notes and hunted down the venue – St Ambrose Church Hall (who was St Ambrose – Merlin Ambrosius perhaps?). I said hi to the host, Sue Stone, who seemed excited to see me in my leathers (it turns out she used to ride a bike herself). I got ready for my talk. The place filled up. There was a good turn out – a full house pretty much. I started with raising the awen, then went straight into my Oisin story – finishing with Niamh’s song calling him to Tir nan Og. Then I lead them in a ‘lost island’ visualisation, using John Lennon’s haunting ‘Imagine’ song as a prompt for ‘imagining your utopia’. Then I plunged into the main body of my talking, following the awen. I read out an extract from the book, answered some questions and ended with an extract from my next Windsmith novel, The Well Under the Sea, in which I describe my created lost island, Ashalante (an island at the crossroads of time where lost souls find each other). Afterwards I chatted to some of the group members, who shared their enthusiasm for islands. Then I guzzled some caffeine, scoffed some chocolate biscuits for the sugar and hit the road. There was a freezing fog on the way home – not much fun along windy roads, however romantic Dorset mist might seem. It was like being on Niamh’s fairy steed, returning to Erin, trying to find the home I knew – would it still be there? Would I make it back, or would my ‘saddle strap’ snap (I discovered my tank bag’s strap had come loose) and I be overwhelmed with mortality? It certainly felt possible in the freezing pitch black night. But the roads were clear and I felt awake enough. I stopped in Salisbury for refueling (myself and the bike) and made it back for midnight. I needed a dram of whisky when I got in, and a hot water bottle – but even that didn’t stop me feeling cold. I really needed a long soak. Wrapping myself in my duvet just kept the cold – which had numbed my extremities – in. Due to the high levels of caffeine I needed to get home, I wasn’t able to get to sleep, despite being exhausted. Blearily, I ‘awoke’ up at 5am, made myself a tea and snack and read until I finally fell into blissful sleep…but not for long enough. Could have slept the rest of that morning but had loads of marking to do. Had it all been worth it? The New Age entrepeneur certainly made more out of it than I did (if I had been paid a pound for every mile travelled there and back I would have felt my effort more fairly remunerated – I got basic expenses, and a basic fee but nothing to warrant my exertion). Nevertheless, things can be reciprocated in ways we don’t realise. You never know if someone had been touched by what I had said. Inspired. Certainly the people that came up seem to be. One Scottish lady enthused about the book on islands she was going to write. If I had sparked something, then it had been worthwhile…but at the moment, with my aching bones and bleary head, it doesn’t feel so! The previous day had been, in comparison, a joyous breeze. A beautiful Spring day, I took the bike out for a spin on the Mendips, taking my route to Chew Valley along lanes lined with golden daffodils (so different in the daytime!) and stopping off at Stanton Drew – having a coffee in the beer garden of the Druid’s Arms next to the Cove (remains of an ancient burial chamber). Then I took the back roads to Priddy, and to Deer’s Leap – a picnic site with stunning views over the Somerset Levels, which looked spectacular on such a clear day. Glastonbury Tor rose mythically from the haze, like a dream of Camelot. A good place to get a perspective on things. Then I called in on my friends Amy and Jose who had just moved into a lovely cottage near Wookey, on the side of the Mendips. It was good to catch up with them, and see their place – which made me green with envy! I took Jose a bottle of rum to thank him for helping me out with my bike, and some chocolate and wine as a house-warming. Yet a cup of tea and a good old chat can’t be beaten. I returned in the fading light, carrying the sun inside me. This entry was posted in bard, Bard on a bike, Way of Awen and tagged Badbury Rings, Bard on a bike, Bournemouth, Dorset, Glastonbury Tor, Lost Islands, Mendips, mist, motorbike, Positive Living, Stanton Drew, Wookey on March 17, 2009 by Kevan Manwaring.